This is a tiny blog. Visual learners when asked what a "congruent" triangle is, get confused. It's just another math term to learn. One day, I simply said to the kids, "Just replace the r in congruent with an l to get the new term "congluent". Then I pointed out that the clue was the word glue. 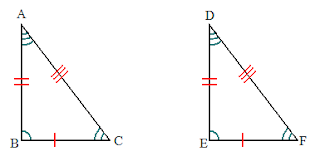 If two triangles are "congluent" they can be cut out and glued on top of each other. For some reason, this simple change seemed to "stick."